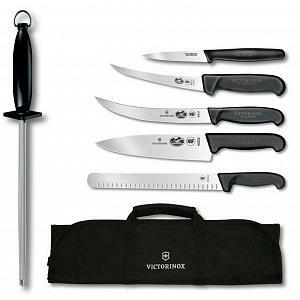 This barbecue knife set from Victorinox includes a 3.25" paring knife, 6" semi-stiff boning knife, 8" chef's knife, 10" Slicer, 10" Cimeter, 9" regular cut honing steel, and a knife roll for easy and convenient storage. 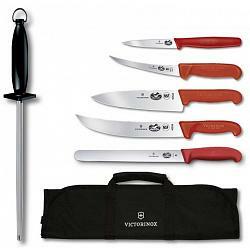 The knives all feature high carbon stainless steel blades with red non-slip Fibrox handles that provide a comfortable and secure grip. 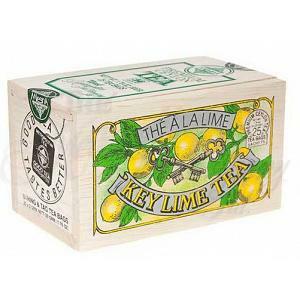 The knife roll holds up to 8 knives with a length of 12" or less. 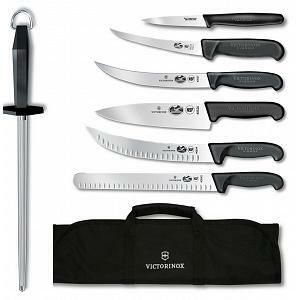 This knife set is made in Switzerland by the makers of the Swiss army knives and has a lifetime warranty.